✔ 100% CERTIFIED ORGANIC - Our swaddle blankets are woven from the best, highest-quality certified organic cotton muslin. That means your baby will have the most restful, healthy sleep. 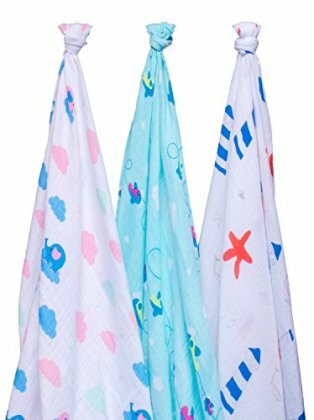 ✔ BETTER SLEEP FOR YOUR BABY - These are the most amazingly soft baby blankets designed to help your baby sleep more restuflly. The organic cotton fabric gets even softer the more you wash it. ✔ EASY SWADDLING - Our blankets are an ideal size for swaddling (47 inches by 47 inches) and come with swaddling instructions, making it easier than ever before. Plus, their generous size allows you to use them in versatile ways such as a stroller cover, car seat cover, nursing cover, receiving blanket and play-mat. ✔ DESIGNED IN USA - We are a loving couple in California who wanted to create the best baby blankets for all our extended family. We are extremely proud of the high quality we've been able to achieve with CozyCloud--much higher than any else we've seen. Their unisex designs also make this muslin gift set a great one for baby showers. ✔ LIFETIME WARANTEE - With our 120 Day Money Back Guarantee, and Lifetime Warranty on our premium products, you can rest assured you'll be happy. Even if you're not sure, you can try them out. Just click the add to cart button on this page.